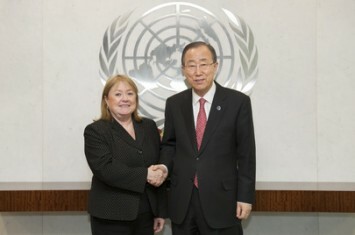 © UN Photo/Rick Bajornas | Susan Malcorra (left), outgoing Chef de Cabinet to the Secretary-General, pays a farewell call on Secretary-General Ban Ki-moon on 25 November 2015. Of the six female USG's who retired this year, all were replaced by men. As the clamour grows for a woman to be chosen as the next Secretary-General, other high-level staff appointments have been quietly but steadily defying the UN's longstanding goal of gender parity. Seemingly unnoticed, this year's selections for the seniormost level of UN staff have skewed nearly 92 per cent male. Between 1 January and 10 December 2015, 22 men and only two women were appointed as UN undersecretaries-general, according to public sources. 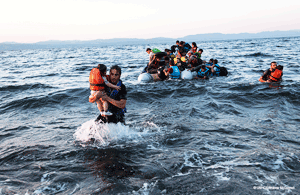 The rhetoric of UN achievements has overshadowed the reality. And the reality can be surprisingly hard to verify. A list of senior officials indicates that the UN designates some 80-plus persons worldwide as undersecretaries-general (USGs), and over 100 as assistant secretaries-general (ASGs). Almost twenty years ago, the UN made a commitment to achieving gender parity in managerial and decision-making roles by the year 2000. This target having been missed, subsequent resolutions aimed for parity in “the very near future”, except for the category of Secretary-General’s Special Representatives and Special Envoys, which was to be gender-balanced by 2015. Two recent developments in gender equality are worth noting. In October, the Global Study on UNSC resolution 1325 made the case for the UN to do a better job of including women in its core business, the field of peace and security. And last month, Canada's new Prime Minister Justin Trudeau showed leadership in announcing a cabinet with equal numbers of men and women. "Because it's 2015," said Trudeau. Secretary-General Ban Ki-moon often mentions that he has appointed more women to senior UN positions than ever before, saying, "You need to have political will." Four years ago, he told a gathering that the UN's top humanitarian official, high commissioner for human rights, head of management, top lawyer, and "even our top cop, are all women." Today, they are all men. At that moment, too, the largest-ever number of women - “five and counting” - were leading UN peacekeeping missions. The same is true today: women head five out of sixteen UN peacekeeping missions. This year also saw six women undersecretaries-general replaced by men, further undercutting the goal of building female leadership within the UN. The first female USG of the year was appointed only in October. At the next level down – assistant secretaries-general, or ASGs – male appointments made up 77 per cent. Cumulatively, across the 59 USG and ASG appointments, 83 per cent were men. It is especially striking that of the 23 EU nationals appointed to top-level UN posts this year, all but one were men. Five were British men. Among African nationals appointed, women made up over one-quarter. Nearly two decades ago, the General Assembly pointed out the importance of the Secretary-General's "visible commitment" to achieving the targets of women's participation in the UN. The dominance of male senior appointments this year calls into question Ban’s commitment to gender parity at the top of the UN, so evident earlier in his tenure, and leaves in tatters what was shaping up to be a solid legacy. Information on senior appointments can be patchy. Often, press releases omit the grade level, and do not distinguish decision-making positions from those that are part-time and largely unremunerated (and which are excluded from this review). Moreover, the UN can give the impression of massaging the data to show the appointment of senior women in a more flattering light, according to Professor Rob Jenkins, who cites a graph on senior managers in UN peace operations showcasing women "in a managerial bracket specifically devised to include more junior positions and exclude some that are higher up." Several measures are needed. The first step is greater transparency around senior appointments. The UN should promptly set up an open database covering full-time, paid appointments at the most senior levels, making it easier to monitor benchmarks towards gender equality. Second, governments themselves need to demonstrate stronger commitment to gender equality in the UN. Although UN staff are required to maintain independence from their governments, some governments lobby hard to have their citizens selected for senior UN posts. While proposals for good candidates, from any source, can be entertained, the impact on gender parity should be a stronger consideration. 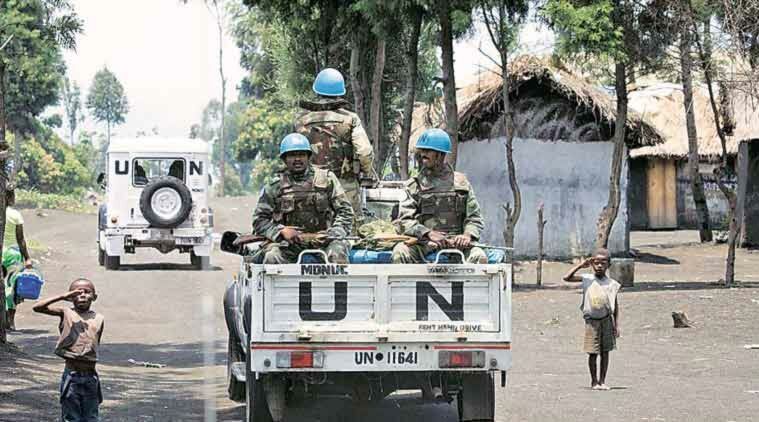 Finally, to insulate the Secretary-General more effectively from external pressures, the UN should set up a merit-based appointments mechanism for senior levels, as recommended by the recent High-Level Independent Panel on Peace Operations. More effort also needs to go into head-hunting great female candidates, as Kofi Annan did in naming former Irish President Mary Robinson to serve as the UN High Commissioner for Human Rights. The biggest lesson of 2015 is how quickly gains turn to losses, without the dedicated attention of a gender-sensitive UN leadership – and how untroubled the UN and member states appear to be. The level of structural non-compliance facing the gender parity agenda won't be fixed simply by choosing a female Secretary-General. Years of General Assembly resolutions mean that this task is already in the job description of the next office-holder. Ending the gender disparity in top appointments would be a good place to start. For full visualization of the data, visit our Featured Data page. 1) Note: the three-month interim appointment of Mark Kroeker (USA), ASG, Deputy SRSG, UNMIL not included in calculation. 2) Note: if the first of two 2015 appointments of Mr T. Gettu and Ms B. Keita are excluded, the figures change marginally, to 92% male USG, 81% male ASG, for 85% overall male appointments. 3) The SG appointed nearly as many senior men in November 2015 - nine - as he did senior women in all of 2015.